Series Two post, where we fangirl a bit about Tennant. Strangely enough, this was a hard series to choose favorites. I had a few I absolutely adored, and some that were a bit on the ‘bleh’ side. Martha grew on me as I rewatched this series, but I didn’t really like her that much the first time through. Sherry - Agreed. I liked Martha, but she never stacked up to Rose as a companion. Funny that she felt the same way too... and ultimately I think that’s why she chose to return to her career path. I needed this fun and silly story to balance out the sadness of losing Rose. Many of my friends who were already Whovians told me that Donna is their favorite companion, so I was excited to meet her. Donna ranks up pretty high (2nd, if you are keeping score at home!) on my younger son’s “favorite companions” list, and on mine as well. She is a mirror for all the women out there who don’t believe they are anything special - though it will take until next season for us to really find out how important she is. Wow… just wow! Let me preface my adoration by saying that my eleven year old loves this storyline, but my nine year old hated it. Why would a fourth grader hate this story? He had nothing but disdain for the fact that his beloved Ten would lower himself into becoming fully human. Perhaps he doesn’t QUITE grasp the love the Doctor has for our lowly species? I thought the actors who played the “Family” were amazing. So deliciously creepy! Sherry - These episodes rated high on the creepy scale for me with The Family and the animated scarecrows. I was frustrated (much like Maria’s 9 year old) because I just wanted 10 to be the DOCTOR, not the human John Smith. Poor Martha endured much for him as she tried to help him remember his self and return to being the Doctor. Sherry - This seems to be the episode EVERYONE talks about! I know it has very little of the Doctor in it, but the whole episode is just so intriguing! The twists and turns with the Easter eggs in the DVDs, the past/future overlapping, the time travel, and the ENDING -- just perfect. I agree that it makes the all-time top 10 episodes. It truly is that good. Sherry - Oh my word, the crazy Master? What in the world?! I didn’t know whether to laugh at him or be frightened! I loved how Martha has grown so much during this season. Her independence is awesome in this finale. I just recently rewatched this one with my older son. I have to admit, it doesn’t go on my favorites list. I DO love how Martha has grown by this story, though. I truly wish I had liked her more, since I adore the fact that she has the strength to choose another life - and her career as a physician - over pining away over Tennant. The other thing I like is that my sons and I use the “Master’s Knock” as an inside joke all the time. 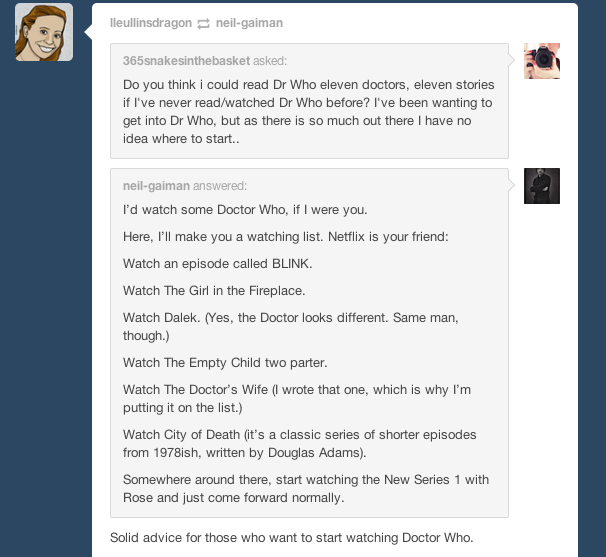 What does Neil Gaiman suggest new Whovians watch? Many of the episodes we say are our favorites, too!